Contact person: Professor Håkan Wallander, phone: +46 (0)46 222 3759. Personal web page. The Dept of Microbial Ecology in Lund started in 1972 when a research group specializing in ecological aspects of microorganisms moved from the Dept of Microbiology to the newly established Ecology Building. From the early 1970´s extensive research has been going on around the theme ”Soil microorganisms and control mechanisms in soil”. Two main research directions have been developed: Soil microorganisms and Nematophagous fungi. Both had received international recognition, and has been financed by research grants, mainly from the Swedish Natural Science Research Council. Studies of the Mycorrhiza symbiosis started in the early 80’s and gradually developed to its present strong position. During the 1980’s the research group gradually became established as an independent division. A course in Microbial Ecology was given for the first time in 1979, and it became a separate division within the Dept of Ecology, with a separate professorship since 1987. 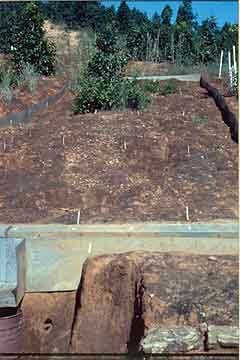 The photo shows an experimental plot in Jhikhu Khola, Nepal, where soil erosion is measured and the effect of different plant species on soil loss is estimated. Håkan Wallander is a professor in soil biology and environmental sciences. He works mainly with ectomycorrhizal fungi that form symbiotic relationships with trees. They produce several hundreds of kilogram of mycelia per hectare every year in most forest ecosystems. This is important for nutrient uptake of the trees, but also for carbon sequestration and N retention in the soil. His main research interest is to understand how this flux of carbon belowground is regulated, and how important the composition of the ectomycorrhizal community is for carbon sequestration and nutrient uptake. Part of his research has been carried out in Nepal, in areas where the soil is prone to erosion and salinization. He has worked on a research project entitled ”Influence of mycorrhizal fungi in stabilizing soils in areas subjected to erosion”. Abstract: Many soils around the world are subjected to erosion, which causes deterioration of land and loss of productivity of soils. This project focuses on the role of mycorrhizal fungi in improving such soils in Nepal and Tunisia. Mycorrhizal fungi produces external mycelium that binds soil particles together to aggregates and they are efficient in taking up phosphorous from soils which is especially important as many soils subjected to erosion are low in phosphorous availability. Methods developed by the researchers are used to quantify external mycorrhizal mycelium in the field and to investigate the role of mycorrhizal mycelium to counteract erosion. Preliminary studies in Nepal have revealed a positive relationship between arbuscular mycorrhizal colonization and P status of degraded soils. This suggests that the fungus have taken up poorly soluble P sources from the soil, which has been transferred to a more available form. The Swedish International Development Cooperation Agency (SIDA) financed this project. At the Development studies research conference held at Lund University in January 2003 Håkan Wallander presented the project in a paper called ”Can fungal hyphae be used to counteract soil degradation?” Read abstract! On Thursday 17 October 2013 Håkan Wallander held a SASNET lunch seminar at Lunds konsthall. The presentation was entitled ”Soil – the basis of our existence. Examples from Nepal, America and Amazonas”, and attracted a large audience, many of them deeply intersted in gardening. With examples from three different places on earth, two in America and one in Asia (Nepal), Håkan Wallander demonstrated how dependent we are on a living soil, and gave us a glimpse of the immense diversity we are stepping on every day. See the poster. The seminar is now available on Youtube, go for it! The lunch seminar presentation was based on his recent book ”Jord – Funderingar kring grunden för vår tillvaro” (Soil – Reflections on the Basis of our Existence), published by Atlantis, 2013. This book has been widely praised and at the 2013 Göteborg Book Fair, it was given the award ”Årets Trädgårdsbok 2013” by Gartnersällskapet. In the motivation, it is said that Prof. Wallander in a personal way presents global and local aspects of soil and cultivation in an ambitious holistic manner. Geeta Shrestha Vaidya was a Nepalese sandwich programme student, coming from the University of Kathmandu, who carried out her PhD Candidate at the department. In 2004 she spent two months at the department in Lund. She worked on a research project dealing with creating new vegetation on eroded soil, especially studying fungi living in symbiosis with roots of plants, and how these are affected by adding compost. Fungi are essential for a successful recolonialization of plants. Geeta Shrestha Vaidya has been working as a Scientific Officer in Nepal. One of the scholarship holders was PhD candidate Firoz Hussain Shah, with a Degree of Master of Philosophy (M.Phil) in Biotechnology from Delhi University. He was selected for the Dept. of Microbial Ecology, where he was supervised by Prof. Anders Tunlid and Associate professor Tomas Johansson. His primary research interest is Enzymes and proteins secreted by ectomycorrhizal fungi, related transcriptome and the genes, role in C-sequestration in forest soils. The methods he uses are Secretome and gene expression analysis. Another PhD guest student admitted through the EMECW programme was Pramod Kamble, working on a thesis dealing with soil ecology. The title was ”Studies on Nutrient Limitation for Bacterial and Fungal Growth in Soil”. Mr. Kamble came from the Pravara Institute of Medical Sciences in Loni, Maharashtra, India. At Lund University, he was supervised by Prof. Erland Bååth.